Not to be confused with GameStop. CNET is an American media website that publishes reviews, news, articles, blogs, podcasts and videos on technology and consumer electronics globally. Founded in 1994 by Halsey Minor and Shelby Bonnie, it was the flagship brand of CNET Networks and became a brand of CBS Interactive through CNET Networks' acquisition in 2008. CNET originally produced content for radio and television in addition to its website and now uses new media distribution methods through its Internet television network, CNET Video, and its podcast and blog networks. Compete.com was a web traffic analysis service. The company was founded in 2000 and ceased operations in December 2016. A console game is a form of interactive multimedia entertainment, consisting of manipulable images generated by a video game console and displayed on a television or similar audio-video system. The game itself is usually controlled and manipulated using a handheld device connected to the console, called a controller. The controller generally contains a number of buttons and directional controls such as analogue joysticks, each of which has been assigned a purpose for interacting with and controlling the images on the screen. The display, speakers, console, and controls of a console can also be incorporated into one small object known as a handheld game. PC Magazine is an American computer magazine published by Ziff Davis. A print edition was published from 1982 to January 2009. Publication of online editions started in late 1994 and continues to this day. IGN is an American video game and entertainment media website operated by IGN Entertainment Inc., a subsidiary of Ziff Davis, itself wholly owned by j2 Global. The company is located in San Francisco's SOMA district and is headed by its former editor-in-chief, Peer Schneider. The IGN website was the brainchild of media entrepreneur Chris Anderson and launched on September 29, 1996. It focuses on games, films, television, comics, technology, and other media. Originally a network of desktop websites, IGN is now also distributed on mobile platforms, console programs on the Xbox and PlayStation, FireTV, Roku, and via YouTube, Twitch, Hulu, and Snapchat. TV.com is a website owned by CBS Interactive. The site covers television and focuses on English-language shows made or broadcast in Australia, Canada, Ireland, Japan, New Zealand, the United States, and the United Kingdom. It emphasizes user-generated content. Australia and UK versions of the website are also available, at au.tv.com and uk.tv.com, respectively. In a similar fashion, GameSpot AU (Australia) existed on a local scale in the late 1990s with Australian-produced reviews. It ceased in 2003. When a local version of the main CNET portal, CNET.com.au was launched in 2003, Gamespot.com.au content was folded into CNET.com.au. The site was fully re-launched in mid-2006, with a specialized forum, local reviews, special features, local pricings in Australian dollars, Australian release dates, and more local news. GameSpot Japan in its current form launched in 2007. It provides Japanese video game industry news, previews, reviews, features, and videos as well as translated articles from the other GameSpot sites. GameSpot staffers Jason Ocampo, Alex Navarro, Ryan Davis, Brad Shoemaker, and Vinny Caravella also left as a result of Gerstmann's termination. Davis co-founded Gerstmann's subsequent project, Giant Bomb, and was later joined by Shoemaker and Caravella. Navarro became the community manager at Harmonix and in 2010 joined up with Whiskey Media, a family of sites that includes Gerstmann's Giant Bomb site, to be part of their new site Screened.com, focusing on cinema and television. Navarro later returned to Giant Bomb, where he currently works as a Senior Editor. On March 15, 2012, it was announced that CBS Interactive, the parent company of GameSpot operator CNET, had acquired the Giant Bomb and Comic Vine websites from Whiskey Media. As part of the deal, the non-disparagement agreement between Gerstmann and CNET was nullified, allowing him to finally speak publicly about his termination over four years prior. Later that evening on GameSpot's On the Spot web show, GameSpot VP John Davison appeared on camera with Gerstmann, marking Gerstmann's first appearance on the GameSpot web site since November 2007. In the segment, Gerstmann revealed that his firing was in fact related to the low review score he had given to Kane & Lynch , though his explanation cited other similar events that led up to the termination, including a 7.5 (good) rating given to Ratchet & Clank Future: Tools of Destruction by Aaron Thomas, then an employee under Gerstmann. GameSpot's forums were originally run by ZDNet, and later by Lithium. [ citation needed ] GameSpot uses a semi-automated moderation system with numerous volunteer moderators. GameSpot moderators are picked by paid GameSpot staff from members of the GameSpot user community. Due to the size and massive quantity of boards and posts on GameSpot, there is a "report" feature where a normal user can report a violation post to an unpaid moderator volunteer. The ostensible purpose of the reporting feature is to deal more quickly with violations of the website's posting policy. GameSpot's ToS states that users must be aged 13 or older to post content and maintain an account. Proof of a user's age when he/she creates an account is not required. Proof of a moderator's age is also not required. All users must agree to GameSpot's ToS (terms of service) during registration. GameSpot's ToS (as they apply to the community forums) give moderators the power to use their own discretion when deciding if a posting violation has occurred. In addition to the message board system, GameSpot has expanded its community through the addition of features such as user blogs (formerly known as "journals")  and user video blogs. Users can track other users, thus allowing them to see updates for their favorite blogs. If both users track each other, they are listed on each other's friends list. Unreal Championship is a first-person shooter video game developed by Epic Games and Digital Extremes, published by Infogrames, and released exclusively for the Xbox. Unreal Championship is essentially a console version game of the PC-based Unreal Tournament 2003, developed specifically to take advantage of Xbox Live, Microsoft's online gaming service. In 2003 Unreal Championship was added to Microsoft's "Platinum Hits" line of Xbox games. It was followed in 2005 by Unreal Championship 2: The Liandri Conflict also for Xbox. Jeffrey Michael Gerstmann is an American video game journalist. Former editorial director of the gaming website GameSpot and the co-founder/editor of the gaming website Giant Bomb, Gerstmann began working at GameSpot in the fall of 1996, around the launch of VideoGameSpot when GameSpot split PC and console games into separate areas. He shared his thoughts on a variety of other subjects every Monday on his GameSpot blog before his controversial dismissal from GameSpot in 2007 following a review of Kane & Lynch: Dead Men. As a member of Spike Video Game Awards' advisory council until its cancellation, Gerstmann was 1 of 25 journalists responsible for voting the nominees and winners of the event. Complex magazine named Gerstmann in their top 25 biggest celebrities in the video game industry. GamePolitics.com was a blog which covers the politics of computer and video games. GamePolitics was launched by freelance journalist Dennis McCauley in March 2005. At the time, McCauley was the video game columnist for the Philadelphia Inquirer, a position he held from 1998-2009. Growing somewhat bored of writing video game reviews, McCauley created GamePolitics in order to track the political, legal and cultural impact of video games. The site was often referred to as GP by followers. Blazing Angels: Squadrons of WWII is a flight combat video game for Microsoft Windows, Xbox, Xbox 360, PlayStation 3 and Wii. It was developed by Ubisoft Bucharest during the second fiscal quarter of 2006 for both the North American and European regions. The game features 46 different World War II fighter planes and allows the player or players to take part in several World War II events as a fictional squadron. Online support allows 16 players to take part in head-to-head and co-operative battles. Madden NFL 07 is an American football video game based on the NFL that was published by EA Sports and developed by EA Tiburon. It is the first in the video game series to be released for the PlayStation 3 and Wii consoles as launch titles and the last one to be released on the Game Boy Advance. 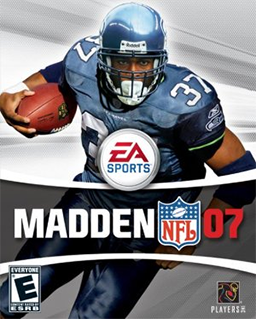 Former Seattle Seahawks running back Shaun Alexander is on the cover. This is the last game to feature NFL Europe in the series. CBS Interactive Inc. is an American media company and is a division of the CBS Corporation. It is an online content network for information and entertainment. Its websites cover news, sports, entertainment, technology, and business. It is headed by Jim Lanzone. Planet Moon Studios was a game development studio based in San Francisco, California founded by ex-Shiny Entertainment developers Nick Bruty (President) and Bob Stevenson (CEO) in 1997. Kane & Lynch: Dead Men is a 2007 third-person shooter video game developed by IO Interactive and published by Eidos Interactive in North America and PAL regions, and Spike in Japan, for Microsoft Windows, PlayStation 3 and Xbox 360. The mobile phone version was developed by Kiloo and published by Eidos Mobile. The game was received with mixed to positive reviews, and spawned a sequel, Kane & Lynch 2: Dog Days. As of January 11, 2008, the game has sold over 1 million copies. GameFAQs is a website that hosts FAQs and walkthroughs for video games. It was created in November 1995 by Jeff Veasey and was bought by CNET Networks in May 2003. It is currently owned by CBS Interactive. The site has a database of video game information, cheat codes, reviews, game saves, box art images and screenshots, almost all of which is submitted by volunteer contributors. The systems covered include the 8-bit Atari platform through modern consoles, as well as computer games and mobile games. Submissions made to the site are reviewed by the site's current editor, Allen "SBAllen" Tyner. Wheelman is an action-adventure video game developed by Tigon Studios and Midway Studios - Newcastle and published by Ubisoft in conjunction with Midway Games for the PlayStation 3, Xbox 360 and Microsoft Windows. The game was released in March 2009 and stars Vin Diesel. A review aggregator is a system that collects reviews of products and services. This system stores the reviews and uses them for purposes such as supporting a website where users can view the reviews, selling information to third parties about consumer tendencies, and creating databases for companies to learn about their actual and potential customers. The system enables users to easily compare many different reviews of the same work. Many of these systems calculate an approximate average assessment, usually based on assigning a numeric value to each review related to its degree of positive rating of the work. Giant Bomb is an American video game website and wiki that includes personality driven gaming videos, commentary, news and reviews, created by former GameSpot editors Jeff Gerstmann and Ryan Davis. The website was voted by Time magazine as one of the Top 50 websites of 2011. Originally part of Whiskey Media, the website was acquired by CBS Interactive in March 2012. Whiskey Media was an American online media company founded independently by CNET co-founder Shelby Bonnie in 2008. It was the parent company of Tested, Screened, and Anime Vice, and the former parent company of Giant Bomb and Comic Vine. Whiskey Media websites are wiki community based, while maintaining an editorial staff. The company's target demographic are focused primarily on males between 10 and 30. The name "Whiskey Media" is a reference to a Kentucky distillery that was owned by the family of Shelby Bonnie before prohibition. Whiskey Media operates in San Francisco, California, after previously being located in Sausalito. On March 15, 2012, Whiskey Media was acquired by Lloyd Braun and Gail Berman's BermanBraun along with Tested, Screened, and Anime Vice while Giant Bomb and Comic Vine were bought separately by CBS Interactive. Call of Juarez is a Western-themed first-person shooter video game series from Polish developer and publisher Techland, as well as until 2018, French publisher Ubisoft; currently comprising four installments. ↑ "Gamespot.com Site Info". Alexa Internet . Retrieved April 1, 2014. ↑ "GameSpot.com WHOIS, DNS, & Domain Info - DomainTools". WHOIS . 2016. Retrieved February 15, 2016. ↑ "Results of Spike TV's 2004 Video Game Awards". Archived from the original on June 14, 2006. Retrieved June 9, 2006. ↑ "Site Profile for gamespot.com". ↑ Navarro, Alex (July 14, 2006). "Burning Questions: July 14, 2006". Archived from the original on September 30, 2007. Retrieved March 23, 2007. ↑ Willmott, Don (February 9, 1999). "The 100 Top Web Sites". PC Magazine . 18 (3): 114. ↑ Olafson, Peter (December 7, 2000). "BASICS; Sites Keep Up With Games and Gamers". The New York Times . Archived from the original on May 23, 2018. Retrieved May 27, 2018. ↑ "GameSpot Redesign: Frequently Asked Questions" . Retrieved September 29, 2006. ↑ "GameSpot UK Winner, PPAi Awards 1999". Archived from the original on September 26, 2007. Retrieved October 7, 2006. ↑ "GameSpot UK Short Listed, PPAi Awards 2001". Archived from the original on September 26, 2007. Retrieved October 7, 2006. ↑ "GameSpot UK launches". April 24, 2006. Archived from the original on June 11, 2007. Retrieved November 1, 2006. 1 2 3 "Spot On: GameSpot on Gerstmann". GameSpot. CBS Interactive. December 5, 2007. Archived from the original on July 25, 2008. Retrieved December 24, 2007. ↑ "CNET Denies 'External Pressure' Caused Gerstmann Termination". Shacknews. November 30, 2007. Retrieved December 24, 2007. ↑ Orland, Kyle (January 14, 2008). "Gamespot staffer Alex Navarro quits in wake of Gerstmann-gate". Engadget. Retrieved January 14, 2018. ↑ Orland, Kyle (February 4, 2008). "Gamespot exodus continues: Ryan Davis to leave". Endgadget. Retrieved January 14, 2018. ↑ Kasavin, Greg (January 19, 2007). "To Live and Die in L.A." Archived from the original on September 30, 2007. Retrieved May 17, 2007. ↑ "Jeff Gerstmann - Virtual Fools". Archived from the original on March 14, 2008. Retrieved April 15, 2008. ↑ "GameSpot and Giant Bomb, Together". GameSpot. CBS Interactive. March 15, 2012. Retrieved January 14, 2018. ↑ "GameSpot Forums". GameSpot. Archived from the original on August 14, 2005. Retrieved June 22, 2007. ↑ "GameSpot revamps subscription model". GameSpot. CBS Interactive. Retrieved January 14, 2018. 1 2 3 "GameSpot sign-up page". GameSpot. CBS Interactive. Archived from the original on March 21, 2007. Retrieved April 3, 2007. ↑ "GameSpot's Paid Subscription Service is Ending: FAQ". GameSpot. CBS Interactive. January 9, 2013. Archived from the original on February 6, 2013. Retrieved January 22, 2013.